Our supportive Jewish Care staff is here to help you and your family navigate the Holocaust Survivor Support Program eligibility and application process, and explore the range of services available to support Holocaust survivors at home and in the community. As Holocaust Survivor Support Program funds are received by Jewish Care from Claims Conference, limits and special eligibility criteria for funded support applies. This eligibility criteria has been set by Claims Conference. When you first contact our Front Door, you will be asked questions about your background, Holocaust experience, income and assets, and level of need in order to check these details against eligibility criteria set by Claims Conference. We understand answering these questions may be difficult for you. Our caring and friendly staff will sensitively guide and support you through the eligibility and application process. Although funded services provided through the Holocaust Survivor Support Program are available only to support eligible Holocaust survivors at home and in the community, we can help identify other Jewish Care services available to support you. We may also be able to assist carers and family members supporting Holocaust survivors in making referrals to support services. 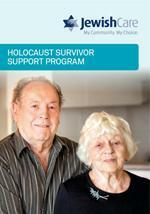 Please download the Holocaust Survivor Support Program brochure at the bottom of this page for answers to frequently asked questions about eligibility and the application process. Note: Each request is considered on its own merits and the unique care needs of each individual. Jewish Care endeavours to support Holocaust survivors by meeting requests for assistance made by eligible Holocaust survivors, however, in some circumstances we may not be able to meet all request or may only be able to make a contribution towards the total cost. 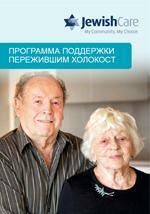 Where possible, we may also try to assist you through other programs and services. For more information about eligibility and the application process, please contact the Front Door on (03) 8517 5999 or submit an online enquiry.